/75 /75 /75 /50 /50 /50 /25 /25 /25 mcg/day. If taken for 4 weeks, then run each dose for 4 days, 5 weeks then each dose for 5 days and so on. It is extremely important that the doses are tapered on and off and that a cycle never exceeds 6 weeks at the most. 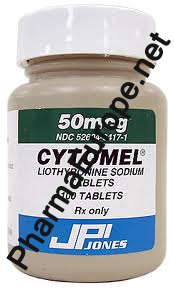 Cytomel® is the popularly recognized brand name for the drug liothyronine sodium. This is not an anabolic steroid but a thyroid hormone. It is used medically to treat cases of thyroid insufficiency, obesity, certain metabolic disorders and fatigue. Specifically this drug is a pharmaceutical preparation of the natural thyroid hormone triiodothyronine (T-3). When administered, Cytomel® increases the patient's metabolism. The result is an increased rate of cellular activity (noted by a more rapid utilization of carbohydrates, fats and proteins). Bodybuilders are particularly attracted to this drug for its ability to burn off body excess fat. Most often utilized during contest preparation, one can greatly decrease the amount of stored fat without being forced to severely restrict calories. To this end Cytomel® is commonly used in conjunction with Clenbuterol and can produce extremely dramatic results. This combination has become very popular in recent years, no doubt responsible for many "ripped" on-stage physiques. It is also noted by many that when thyroid hormones are taken in conjunction with steroids, an increased anabolic effect can be seen (noticeably greater than if the steroids are used alone). This is likely due to faster utilization of proteins by the body, increasing the rate for new muscle accumulation. One should take caution if considering using this drug. Cytomel® comes with an extensive list of warnings and precautions which are not to be ignored. Side effects include, but are not limited to, heart palpitations, agitation, shortness of breath, irregular heartbeat, sweating, nausea, headaches, and psychic/metabolic disorders. It is a powerful hormone, and one that could potentially alter the normal functioning of the body if misused. When administering Cytomel®, one must remember to increase the dosage slowly. Generally one 25mcg tablet is taken on the first day, and the dosage is thereafter increased by one tablet every three of four days for a maximum dosage of 100mcg. This will help the body adjust to the increased thyroid hormone, hopefully avoiding any sudden "shock" to the system. The daily dose is also to be split evenly throughout the day, in an effort to keep blood levels steadier. Women are more sensitive to the side effects of Cytomel® than men, and usually opt to take no more than 50mcg daily. It is important to stress that a cycle should last no longer than 6 weeks and it should never be halted abruptly. As slowly as the dosage was built up it should also be lowered, one tablet every 3-4 days. Taking Cytomel® for too long and/or at too high a dosage can result in a permanent thyroid deficiency. After doing such, one might need to be treated with a drug like Cytomel® for life. It is also a good idea to first consult your physician and have your thyroid function tested. An undiagnosed hyperfunction would not mix well with the added hormone. An athlete should also be sure never to purchase an injectable form of the drug. It is generally an emergency room product, much too powerful for athletic use. Since T-3 is the most powerful thyroid hormone athletes are using, this is generally not the starting point for a beginner. Before using such a powerful item, it is a good idea to become familiar with a weaker substance. The highly popular Triacana is very mild, allowing the user much more latitude (from severe side effects) than Cytomel®. An in-between point is Synthroid (synthetic T-4), still weaker in action than Cytomel®. Once the user is ready however, the fat burning effect of this hormone can be extremely dramatic. On the black market, Cytomel® is readily available. 100 tablets (50 mcg) will sell for approximately $25.00. This price is considerably reduced when purchasing this drug from a variety of mail-order sources. Even lower in price is the Cynomel brand in Mexico. The pharmacy price for 100 25mcg tablets is only a few U.S. dollars.